Nurses are often disappointed when they become Legal Nurses because they learn the information in this article the hard way. When planning your Legal Nurse career, you will save yourself much frustration and avoid wasting money if you are familiar with the topics we are going to discuss. Nurses carry the weight of the healthcare industry on their shoulders. Yet, they are often forced to work in unfavorable conditions, with little appreciation for the sacrifices that they make for others. Many turn to Legal Nurse Consulting because there comes the point in every nursing career where they are no longer able work clinically, or they become burned out. After all they do, Nurses deserve a great career option to fall back on. While Legal Nurse Consulting may be a great career option for them. There is a lot to know before making the transition. The goal of this article is to give aspiring Legal Nurses all the information they need to find the best Legal Nurses training options, and ensure that they can enter into the field successfully. There are a few defining moments in the career of a Legal Nurse that will determine if they will succeed. If uninformed choices are made, the Legal Nurse may never even get their first case. What’s the Demand for Legal Nurses? There are an estimated 1.3 million attorneys in the US. Many of those attorneys handle hundreds of cases per year. Every case involving medical records needs a medical expert to interpret them. Therefore, there is a strong demand. Legal Nurses offer some great benefits because of their role in the clinical setting. They can provide a more accurate medical review, at a more reasonable price than doctors. You don’t need a certification to practice as a Legal Nurse. All you really need is a nursing background and some medical expertise. While most Legal Nurses are RNs, some LPNs practice as well. You should have enough experience to be familiar with medical standards of practice and should be able to understand and interpret what is happening in a set of medical records. Typically, around 2 years or more of nursing experience is recommended. Even though a certification is not required, most Nurses will need one. The certification will show them some of the intricacies of the industry, such as the legal process, finding cases, and working the cases. It is important to know that all Legal Nurse training and certifications are not the same, and you should take the time to compare the benefits of each. Choosing a course with inadequate training can make it much harder to make money in this field. Legal Nurse Consultants have three options when it comes to deciding how they will work. The pay is determined by the option that us chosen by the Nurse. The first option is to find a full or part time job at a law firm, insurance company, or managed care organization. In-House Legal Nurses typically earn an hourly pay of $20-$60 per hour, but expect the lower end of that range. The second option is to start a consulting practice. Most Nurses prefer this option because they no longer want to work for someone else, they get more flexibility in their schedule, and they receive more respect for their expertise. Independently practicing Legal Nurse Consultants typically earn $125-$200 per hour to consult, and can earn $300-$500 per hour to work as an expert witness if they desire. It is very important to know that there are no universally accepted standards for Legal Nurse Consulting, there is no official governing body, and there are no related laws. Each organization is responsible for maintaining their own certifications, and they are responsible for ensuring that their certified Nurses meet their standards. Therefore, the program you choose will determine the quality of training you receive. To earn a Legal Nurse certification, the Nurse must meet the training requirements of that specific certification. While there are several Legal Nurse certifications available, each one is only available through its own specific governing organization. Each course offers a different curriculum, different levels of support, different tools, and different resources. Some courses have very outdated and ineffective curriculums and offer very little support after you are finished, while others are more updated and provide support throughout the entire process. Some courses include marketing tools that make it easier to get cases, while other courses have you make your own or offer outdated marketing tools. Some have a very high percentage of graduates who find cases, while others have very poor statistics. There are many other differences. The important part is to take the time to compare, and make your choice based on qualities that will make a difference in your Legal Nurse career, and make it easiest for you to begin making money in the field. The scary truth behind Legal Nurse Consulting is that most Nurses who take a course or certification are never able to get their first case. This is not because there is no demand, and it is not because the industry is smothered. It is because most Legal Nurse courses do not train Nurses adequately and fail to provide them with the support they need to make the transition. In the end, if the Legal Nurse is learning an outdated curriculum, doesn’t know exactly how to work a case from start to finish, and doesn’t know how to find the cases, then they probably won’t succeed in this industry. Surprisingly, this is a problem among many courses, even ones that claim to be accredited and courses that have been around for a very long time. Luckily there are some great options out there, like LNC STAT, which works diligently to battle this problem to ensure that Nurses can rely on this career option. 1) Accreditations are NOT Important for Legal Nurse Consulting: The truth is, accreditations will not determine how successful you will be as a Legal Nurse. They are completely unrelated to the quality of their Legal Nurse training and standards. All they do is set some general training and testing standards. They do not apply to the curriculum or Legal Nurse Consulting methods taught in the course. Therefore, courses with major accreditations often teach outdated curriculums that are not very effective. In the end, your medical background and your years of medical experience is what will impress the attorneys. That is why they would hire you. 2) 2000 Hours of Legal Nurse Experience are NOT required: Some organizations require that beginner Legal Nurses work 2000 hours before they can become certified. This is only the requirement for those specific organizations. Other organizations have other requirements. The 2000 hour requirement forces Legal Nurses to practice in-house jobs for little pay. It conditions them for that specific role without exposing them to work as an independent consultant. In the end, it is just dragging out the process, ignoring the fact that Nurses already have the medical expertise they need to begin practicing. Nurses simply need to learn how to put their expertise to work in the legal field, and that does not take 2000 hours. 3) The Industry is NOT Saturated: Even though thousands of Nurses enter the field of Legal Nurse Consulting, most of them never secure their first case, or are able to do anything with their training. This is because they chose a course with inadequate training, or they lack the motivation to put their new expertise to work. If you have heard that the Legal Nurse market is saturated, ask them which course they took, because their lack of success is reflective of that course. 1) Curriculum: Comparing this aspect is very important since it varies with each course. The best way to determine the comprehensiveness of a course curriculum is to compare the contact hours. For example, LNC STAT’s Advanced Legal Nurse Consultant (ALNC) certification course offers 120 contact hours, while others only include 40-60. Therefore, with LNC STAT, you will learn much more, you will be better prepared when you start practicing, and you get more value for your money. 2) Mentoring and Support: Most Nurses will need support throughout the transition process, and thereafter. It is a great feeling to know that you can access help whenever you need. Some courses offer no support after you complete the course, or charge extra fees. LNC STAT offers unlimited mentoring. You have support during your training process, and even after you finish your training and are trying to get cases or are working cases. 3) Marketing: You may be the best Legal Nurse in the world, but if you don’t know how to find the cases and secure those cases effectively, you won’t get too far in this industry. This is where effective marketing techniques and tools become important. The best courses include researched and targeted marketing techniques. Some courses include marketing tools while some require you to pay for them separately. Many don’t offer marketing tools at all. Nurses shouldn’t have to make their own marketing tools, since most of them don’t have marketing experience in the legal field. Additionally, the course should also show you current and effective marketing techniques. For example, trifold brochures no longer work and are an outdated form of marketing. If a course is offering or teaching you to use them, that is definitely a warning sign. 4) Reviews and Testimonials: It’s amazing how many Nurses choose a course without basing their decision on the reviews of past graduates. Reviews are very helpful to see what others are saying. When comparing, search for reviews and success stories. Are there a lot of complaints? Are reviews hard to find? Those are big red flags. This holds true for university or college courses as well. 5) Success Rate: It only makes sense that a good training organization will keep track of how well its graduates do when they begin putting what they learned to work. Look for their success rate or some similar statistics. What percentage of course graduates are able to get their first case and make money as a Legal Nurse? If they don’t have this information, or they don’t keep in touch with their Legal Nurses enough to track this information, that tells you a lot. Surprisingly, many Legal Nurse certifications and courses fall short in these key areas. With your time and money at risk, making a hasty decision can seriously prevent you from getting started as a Legal Nurse. 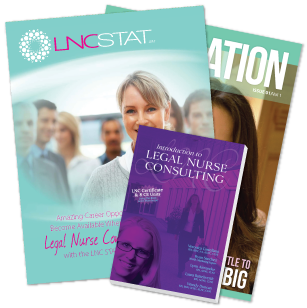 Research and look for these comparisons to get the most out of your Legal Nurse career. If someone you know tells you that they couldn’t get cases after taking a Legal Nurse course, you should be asking which course they took. That complaint is not representative of the entire Legal Nurse industry, and it is typically not the fault of the Nurse. If the Nurse gave an honest effort, but could not get cases, that means the course they took was not comprehensive enough for them to know what to do. Take that into consideration when choosing a certification course. Should you Take a Course at a University? Even though many influential universities offer a Legal Nurse Consulting course, most of their graduates are still unable to find Legal Nurse success. There are many complaints about major deficiencies in their training and lack of personalized attention. Just like with any other major, you are often on your own after you graduate. This shortcoming is no different with their Legal Nurse Consulting courses. They offer no support after you complete the course, and they lack the ability to provide you with vital resources such as marketing tools, contract templates, and report writing templates. Almost every Nurse will need an option like Legal Nurse Consulting at some point in their career. This is because injury, burnout, layoffs, or age can prevent Nurses from working clinically and hands-on. This change can happen gradually or suddenly. At that point, the Nurses have to find another career option that will meet their needs, and Legal Nurse Consulting is a great option. The problem is that most Nurses are unprepared for when these career changing events happen, and they are often left without income. Therefore, the best time to start preparing is right away. Since Legal Nurses can decide how many cases they want to work, they can use this profession for supplemental or full-time income. If they start preparing for when they really need it, they can learn at their own pace, begin practicing on the side if they wish, and be ready to transition into full-time with little down-time. Is there a Demand for Your Medical Specialties? There are legal cases that involve almost every medical specialty. Even if you don’t possess a wide variety of specialties, you can still manage the medical side of many legal cases. In the end, if you are a Nurse, you have the general medical expertise to manage a wide variety of cases. If you come across a case where you need help, you can learn how to hire subcontractors who have the specialties you need to assist you. This way, you don’t have to turn away a case. Most Nurses already have the medical expertise required. The variable that will determine if you will make the transition successfully is you. Are you willing to put what you learn to work? Are you willing to pursue your goals without giving up easily? Do you have a positive attitude towards new challenges and other colleagues? If you answered yes to these questions, then yes, you do have what it takes, and everything else can be learned. Should I Start with a Cheaper Course? Cheaper courses may sound like a better option at first, but they usually end up costing more in the long run. This is because they don't offer comprehensive enough training, and you will have to purchases additional courses after that to get the tools you need. The worst part is that most Nurses don't realize this until they try to put their training to work and are never able to get their first case. If you are willing to take that risk, that is your choice. Just remember that all LNC certifications are not the same. That means you could be spending money on training that doesn’t give you the tools you need to be successful. That would just be a waste of money and time. The initial cost of training and certification may seem steep at first. However, it isn’t a lot of money when looking at the average cost of starting a business. Since independent Legal Nurse Consultants earn $125-$200 to consult, it only takes one or two cases to recover the cost of a certification course. If you choose a high quality certification program, and have access to the right tools and support, all you have to do is complete your training and put it to work. Your first cases will recover that initial expense. The price isn’t too much to pay when you look at what you can get out of it. If you don’t have the money to pay for your course up front, you will have to find a way to pay for it until you can complete your training and get cases that will pay it off. Credit cards and loans are good for this. Some courses offer financing and payments plans as well. For example, LNC STAT’s payment plan is 0% interest. Do your research and choose the best course: Take your time to compare courses and ensure that your chosen course puts the success of its graduates first. Look for the most comprehensive training, the best tools, and the best support throughout the transition process. Ignore any hype or pitches that are not focusing on elements that will make a positive difference in your Legal Nurse career and are not focused on heling you achieve good results. Find your motivation: Every decision we make has motivation of some sort. In the end, it will be up to you to complete the training and put it to work. You will need motivation to complete the transition process and stay focused on your goals. Find what motivates you, and use that as fuel while pursuing the career you want. Complete your training: Register for your course and dedicate the time to complete it properly. Don’t cut any corners because you only hurt yourself. Be meticulous so that you are prepared to put your new expertise to work. Begin your Marketing: Start marketing and make sure your marketing tools are modernized and effective, without outdated tools like tri-fold brochures. Utilize modern forms of marketing that have been targeted for the legal field. Continue marketing until you reach a caseload where you are comfortable. Be Persistent: Don’t give up easily. Many beginning Legal Nurses dedicate time and money to this new career path, but never really put it to work. Some give up at the first sign that some extra work is required. Give an honest effort to ensure that you receive the results you are envisioning. Ask for help: If the course you choose has unlimited mentoring without extra fees, you will always have somewhere to turn when you need help. Don’t be afraid to ask. Legal Nurses who ask questions and utilize their support are the most successful because they can easily overcome any problems they come across. Legal Nurse Consulting is an excellent career path for Nurses. However, it may have some challenges. Most Nurses only get one chance to choose the right course. Without the proper training and resources, overcoming those challenges becomes much more difficult. Your medical expertise is very valuable in the legal field, you just need the right resources to help you put it to work effectively. Choosing the right course can make all the difference in your Legal Nurse career. RN MARKET News features Legal Nurse Consulting related articles written by Veronica Castellana, Ryan Sanchez, and other guest writers. Veronica is the LNC STAT course creator and is a currently practicing Advanced Legal Nurse Consultant. Her training tools and techniques have resulted in some of the most succesful Legal Nurse Consultants in the world. She is now the leader in Legal Nurse success. Ryan is the Director of Marketing for RN MARKET and the LNC STAT course. His valuable expertise helps nurses to realize their true potential and value in the field of Legal Nurse Consulting.